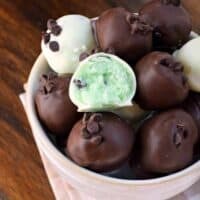 These Mint Chocolate Chip Truffles have a soft, creamy mint chocolate chip center and are coated in decadent chocolate! What are you waiting for? Go make some today! Last month I made some Mint Chocolate Chip Brownies that were simply OUT OF THIS WORLD delicious. They were so good, they got me thinking about truffles. I could just shovel that mint chocolate chip frosting into my mouth, but why not create a treat that serves the same purpose, but is a little more dainty? Okay, maybe not dainty. How about “acceptable”? I mean, do people think it is okay to eat frosting by the spoonful? Sure, in the privacy of your own home, but at parties? 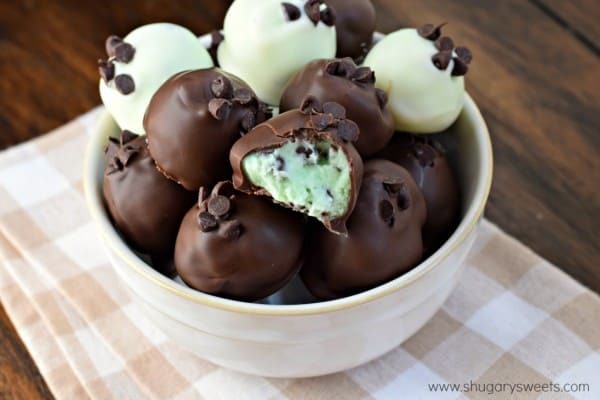 These Mint Chocolate Truffles are the perfect party food! You’ll be the star of the show if you bring a big bowl of Mint Chocolate Truffles along! And I promise that Mint Chocolate Truffles are so easy to assemble. Start with softened butter and cream cheese. If it’s too cold, it doesn’t get as smooth and creamy as you need it for the mint chocolate chip filling! Make sure when it’s time to add the extract you use PEPPERMINT, not mint. Unless you like spearmint. Then these could be known as after dinner truffles…no need to brush your teeth, these would taste like toothpaste. Yeah. Let’s avoid that and just use peppermint, m’kay? Let’s talk food coloring. I get the best results when I use Americolor gels. I dip a toothpick into the gel and “swipe” it into my butter mixture. This little bit is all I need to get the soft green coloring. If you only have drops, just add one drop at a time. Ain’t nobody wanna eat grass colored mints. Ha! Use a 1 Tbsp scoop to portion out your mint chocolate chip filling. You’ll want to drop your Mint Chocolate Truffles onto a parchment paper lined baking sheet. And FREEZE them for about an hour (more than that is fine, too). Use fingertips to shape frozen truffles into a ball. Then use a toothpick to dip Mint Chocolate Truffles into melted chocolate. Again, USE GOOD CHOCOLATE. I love the bags of Ghirardelli Melting Wafers. Not only do they melt smooth, but they taste delicious too. 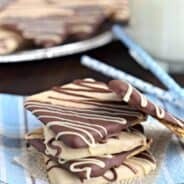 I loved using a combination of white and dark chocolate. Feel free to do both, or choose your favorite and decorate the tops with mini chocolate chips. If you’ve followed along here for a while, you’ll know that I LOVE mint chocolate chip recipes. If you love mint chocolate chip as much as I do, I’ve got plenty of options here for you. In addition to my Mint Chocolate Truffles and Mint Chocolate Chip Brownies, try my Mint Chocolate Chip Fudge, Mint Chocolate Chip Rice Krispie Treats, Mint Chocolate Chip Whoopie Pies, or Mint Chocolate Chip Cookie Sandwiches. 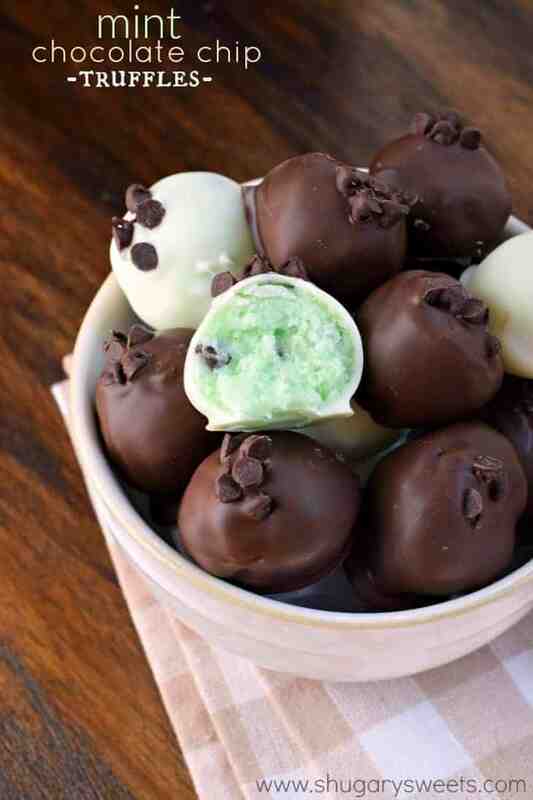 Whip up a batch of these Mint Chocolate Truffles and wow your friends at your next party. I know they’ll love them! These Mint Chocolate Truffles have a soft, creamy mint chocolate chip center and are coated in decadent chocolate! What are you waiting for? Go make some today! Beat cream cheese and butter until creamy. Add sugar, peppermint extract and food coloring. Beat until well combined. 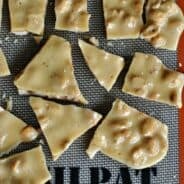 Using a 1 tbsp scoop, drop onto a parchment paper lined baking sheet. Freeze for about an hour (more is fine). Using a toothpick, pick up the truffle and dip it into the melted chocolate, tapping the side of the bowl to remove the excess chocolate. If desired, add a couple of mini morsels for garnish. Store in refrigerator for up to a week. I dare ya to eat frosting by the spoonful at a party, Aimee. Like, I’d pay good money to watch you do that at a really formal party. Whip out that tub of frosting and have at it! These are gorgeous. Love that shade of green! Yum! Eating frosting by the spoonful is always appropriate in my book! Extremely quick and simple to make with my young daughter. Love it!!!!!!! I will definitely try this recipe! Looks super yummy. I love white chocolate and minty flavour. Does it have to be food coloring gel? will regular food coloring do? Oh, Aimee-I could just cry when I see a recipe like this for truffles. I made up truffles just yesterday making my ganache from Belgium chocolate, heavy cream, butter and amaretto. Covering a ball of frosting with chocolate doesn’t quite qualify as a truffle. I agree, Jan. Traditional truffles, these aren’t. However, icing balls as a term hasn’t caught on like cake balls have so it’s the only appropriate name for them at the moment. can you freeze truffles and if so , how long ? You can (although sometimes during the thawing process the chocolate coating my crack, still delish though). As for how long? I’m no expert on that…but I would say at least a month or two! I tried my hand at these. For some reason, my mind didn’t comprehend the amounts and I was originally expecting more cream cheese and less butter and for it to have a “cheesecakey” flavor. I’ll try it again with a half stick of butter and 8oz of cream cheese and see what happens. Thank you for sharing the recipe! In my other life I was at a “dress up” party and the hostess had a gorgeous watermelon basket with the most divine dip ever!! Turns out it was two ingredients, large Cool Whip and rum. Her husband brought out two spoons~ one for each of us~and he also brought the back up dip. We ate the whole thing and resorted to vanilla wafers when the fruit was gone!! Spiced rum, dark rum or plain rum or any other rum or other booze you may have on hand. Triple Sec is also yummy~orange with a kick!! 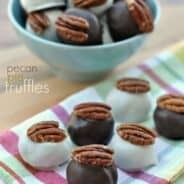 Plan to make these for a ladies luncheon in March. Also plan to freeze them and thaw the day before. Look and sound delicious. I know the ladies will enjoy. Thank you so much for sharing. God Bless You ! ! ! How many truffles does the recipe make ? I can’t find it . I am guessing these can’t be make with low-fat or whipped cream cheese . Is that right? They don’t seem to set. Hmm, I’m not sure why that would happen. You could refrigerate the mixture before scooping if it’s too soft, then scoop and form the balls! Tried the recipe as directed. Because it is too much like icing I had a problem with the balls setting up. Even after an overnight in the freezer. Days later…still soft. I was able, with much trouble, to dip into the chocolate. Surprising, since I only use Ghirardelli! However, the bottoms didn’t firm up and solidify, leaving a gooey mess on the wax paper. We’ve decided to make bars with the rest, using an Oreo crust, and a ganache top layer. Never waste. Just invent another recipe! It is because the ingredients say powder sugar but the instructions never say to add the powder sugar. I️ think you are forgetting to add that into the mixture. What about using a red food color for Christmas time?